Dead Red is a one part red stain remover that excels in the removal of food and beverage stains in synthetic carpets and fabrics. Dead Red alters the structure of stains by making them invisible. Children's drinks, fruit juices and sports drink stains are no match for Dead Red's cleaning ability. 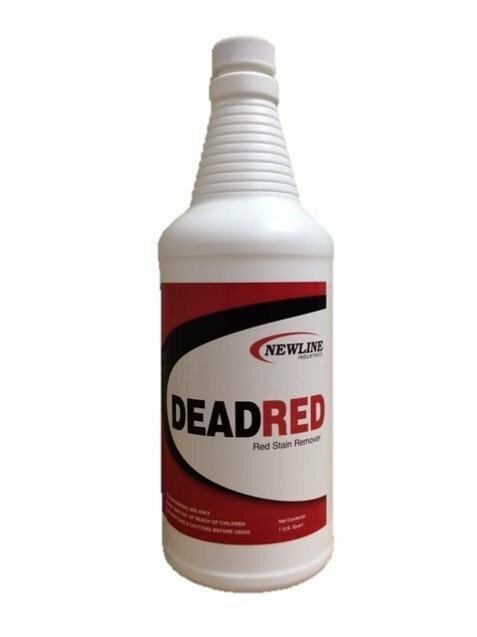 Dead Red is safe and effective on virtually any stain caused by a common household food or beverage spill. Dead Red is for use on synthetic carpet and fabrics only. Not recommended for natural fabrics. 1. Test in an inconspicuous area before using on spot. 2. Clean area thoroughly and vacuum to remove as much moisture as possible. 3. Apply liberally to stained area. 4. Let product dwell for 30 seconds. 5. Extract with hot water. If stain persists, proceed to next step. 6. Lay a damp cloth over the stain, set a steam iron to its lowest setting and place the iron on top of the cloth over the stain. 7. Lift the iron every 20 seconds to check for stain transfer to the cloth from the carpet. Repeat until the stain is gone. 8. Rinse immediately with hot water after steaming the spot. CAUTION: Excessive heat from steaming or failure to extract the spot after steaming can result in carpet fiber damage and/or color loss.